For the August's meeting of City Lit's "Weird and Wonderful" book club, we read Josh Malerman's "Bird Box" (2014), a pretty unusual apocalypse/horror novel. We quite liked the book, stylistically--it's lean, without a lot of world or character building. For those of us tired of the word-bloat that frequently infects modern genre lit, this was a definite positive. We also praised the creepy effectiveness (effective creepiness?) of a few different passages. The premise of "Bird Box" is that people begin seeing something that causes them to become incredibly violent, usually within a few minutes--killing anything around them before committing suicide. Through flashbacks, we see this go from a few isolated incidents to a global, apocalypse-level event,with the only survivors being those who recognize what's going on and blindfold themselves whenever they go outside. We talked a lot about the style of the book. Once again, it's a braided novel, alternating between two-three timelines within the same story. This worked fine, although other than tension engineered by letting us know early that lots of violence happens later in the safe-house, we weren't sure what this accomplished. The bifurcation of the "earlier" timeline was also a little confusing until we caught what was going on. We felt that the pre-boat-escape narrative was by far the more compelling, and wondered if Malerman had accidentally focused on the more interesting backstory instead of the "main" plot. We talked a lot about Malorie's character--we liked how rational and survival-oriented she is, and we wondered whether the failure to name the children until later was 1.) authorial intrusion, unrealistic and done just for the creepy effect, or 2.) a believable action of someone who has proven herself capable of survival but may have been a bit unhinged socially by the trauma endured along the way. We also liked her relationship with Tom, how positivity and a methodical outlook became so inspirational. Also how there's no romance in the book! Good job. Oh Gary. What a weird guy. Compared a bit to the "obligatory crazy guy who ruins or nearly ruins everything" in other survival stories, like the artilleryman in Wells' "War of the Worlds" (1898), a version of whom was played by Tim Robbins in Spielberg's 2005 adaption. We also wondered how/if that umbilical cord scene would work. Science appears to say no. Feel free to google that: there are actually multiple peer-reviewed studies. Huh. Overall we found the characterization very thin, but that's not a complaint--part of what kept this so focused. Lots of praise given to the effective creepiness of the writing in several sections, of which "the trip to the well" stuck out in my mind. Malerman does an excellent job of conveying the horror/ambiguity of moving blindly through a scene, which everyone can relate to at least a little bit. I really liked the way that we don't really know a lot of what's going on in the book, even if there really are "creatures". It reminded me vividly of experiences in the woods at night in my Appalachian youth--when you can't see anything, you start focusing on your other senses so much that it becomes almost hallucinatory. Many's the squirrel and wind-bent branch that my brain frantically interpreted as charging sasquatch. The Twilight Zone episode "Nightmare at 20,000 Feet" (1963), famous for Will Shatner's delivery of "some...thing! On the wing!" Joan Crawford in the "Eyes" segment of "Night Gallery" (1969)--one of Spielberg's first directorial efforts, incidentally. Shyamalan's "The Happening" (2008), which is a ludicrously terrible film and yet pretty similar to "Bird Box". Rifftrax (aka the Mystery Science Theater 3000 team) has a treatment that makes it a little more bearable. The documentary "Cane Toads: An Unnatural History" by Mark Lewis (1988). We got on this topic by talking about invasive species and unexpected side-effects, which might be what's going on in "Bird Box". Related to that, the Radiolab episode about the Galapagos, and particularly the difficulty of eliminating invasive goats. Michael Koryta's thriller "Last Words" (2015), much of which is set in caverns. Last month's CNSC read, Carolyn Ives Gilman's "Dark Orbit" (2015), as well as a story I referenced in relation to that: John Varley's "The Persistence of Vision" (1978), about a self-sufficient community of blind/deaf individuals. Past Weird & Wonderful selection "Lexicon" (2013) by Max Barry--for the thing-that-will-take-you-over-if-you-see-it, and the spec ops headsets that route vision through cameras with a lot of filters to avoid that. I applauded the scientific approach of some of the characters in "Bird Box", filming the outside world and then watching it under controlled conditions--I would have just run that footage through a crazy amount of filtering to remove any mind-hacking semantic information. But they didn't seem to have quite enough know-how/tech to do that. Burgess & McDonald's film "Pontypool" (2008) is bit similar to "Bird Box", but with a verbal rather than visual trigger. We also talked a bit about some other post-apocalyptic survival stories, including Mendel's "Station Eleven" (2014), also set in Michigan (and a fall/winter selection for Weird & Wonderful), and McCarthy's "The Road" (2006). The work that was most commonly in my mind while reading "Bird Box" was "The Screwfly Solution" (1977), by Raccoona Sheldon (aka Alice Sheldon, aka James Tiptree, Jr.). 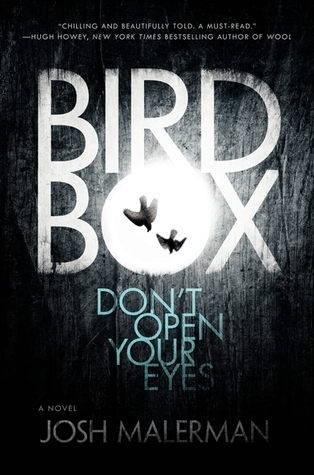 Highly suggested both on its own and as a companion to "Bird Box". An excellent discussion, with great after-discussions as well. Weird & Wonderful's next selection will be China Mieville's 2012 YA, weird-Melvillean "Railsea" . Hi Jacob, thanks so much for writing up such a thoughtful review. We are LOVING it here in North Carolina (great new job, great schools for the kids, awesome home office/travel situation for my husband, a rental house in the woods, etc) but I'm sad to have missed this. I read this earlier in the summer and it would've been fun to debrief with you and the group! Hey Camille, good to hear from you! We miss you at City Lit, but glad to hear things are going well in NC!